The GERB party, which won 116 of the 240 seats in the Bulgarian Parliament, is trying to come up with a new formula for forming a stable government, technically a cabinet of the minority, without a coalition. "What we want to achieve is a cooperation and support on principled political grounds, not coalition haggling for ministerial positions in exchange for parliamentary support", the GERB Chair and Interior Minister nominee, Tsvetan Tsvetanov, said Tuesday in Parliament during the opening session of the 41st Bulgarian General National Assembly. 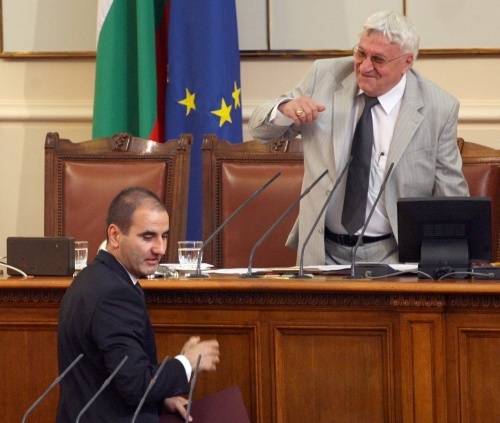 Tsvetanov stated that the fact the 116 MPs of Boyko Borisov's party GERB were not technically a parliamentary majority might give GERB the chance to realize "a new type of government" of Bulgaria. He also said that GERB was going to offer a memorandum for political partnership and support for its new government to all parliamentary parties except for the ones that participated in outgoing three-way coalition government. Thus, the Bulgarian Socialist Party and the ethnic Turkish party DPS are left out of GERB's proposal, and it is expected to be directed towards the Blue Coalition (whose members UDF and DSB are fellow European People's Party members), the conservative RZS ("Order, Law, Justice") party, and the nationalist "Ataka" party. While Tsvetanov's speech in Parliament Tuesday contained no explicit statement that GERB did not want form a coalition, his words stressed the party's attempt to craft a new model of political support with which to compensate for lacking 5 more MPs for a parliamentary majority. The Blue Coalition, RZS, and Ataka, which are all fellow right-wing parties, have expressed their readiness to support the new GERB government even without having ministerial seats. Yet, their representatives have pointed out that they needed clear commitments and arrangements with GERB, and that they were still expecting to be contacted officially by GERB in this regard. "No one can be responsible for certain policies if they did not participate in their preparation", the Blue Coalition Co-Chair, Ivan Kostov, said as he was leaving the consultations at the Bulgarian Presidency on Tuesday. Kostov said he expected some sort of an agreement between GERB and the Blue Coalition for the new cabinet because a minority government would be a sign of instability for banks, investors, and creditors.